Construction of a new 3 story below-grade parking facility. Due to the close proximity of a very active hospital and residential neighborhood, vibration had to be minimized. 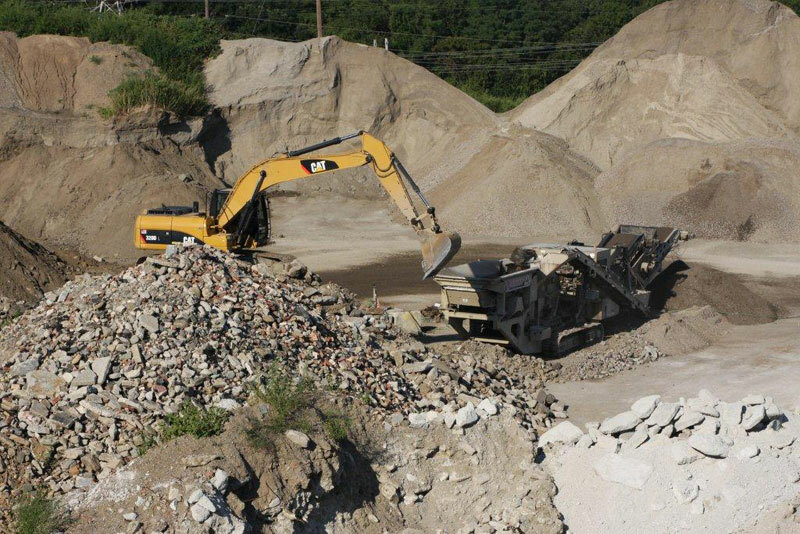 Therefore, during the mass excavation and disposal of 40,000 cubic yards from the site, use of “Augured Piles” for the soldier beam and lagging system with tie-backs was utilized to shore the vertical faces of the excavation. To accommodate the new Parking Garage, the adjacent 3-story structure had to be underpinned to depths varying from 15’ to 30’ feet. Once the concrete foundation was completed, backfilling of the perimeter walls presented a problem due to limited site access. Development of an innovative bracing method to support the newly poured foundation walls and the use of material conveyors enabled the backfilling of these walls prior to any steel erection thereby eliminating any potential coordination and logistical problems with the steel erector. Other components of the project included new curbs, sidewalks and the repaving of the roadway along Booth Memorial Ave and 141st Street. This contract consisted of constructing a new precast elevated parking garage. The placement of the new structure on the site required the designers to incorporate new cast-in-place concrete retaining walls up to 17’ high in addition to the CIP footings and foundation walls to maintain the existing street elevations that bound the structure on three sides. Upon completion of the cast-in-place foundation, the precast columns and deck slabs were erected requiring the use of a 250 Ton Crawler crane which required the need to construct temporary RCA access roads despite the difficult site logistics. Additional site improvement work included modifications to the existing onsite storm sewer system to accommodate the additional runoff generated by the new parking structure, relocation and expansion of the existing watermain system, new concrete curbs, sidewalks, precast retaining walls and reconfiguration of existing entrance roads and parking lots conclude the work of this contract. The reconstruction of 3.50 miles of Rte. 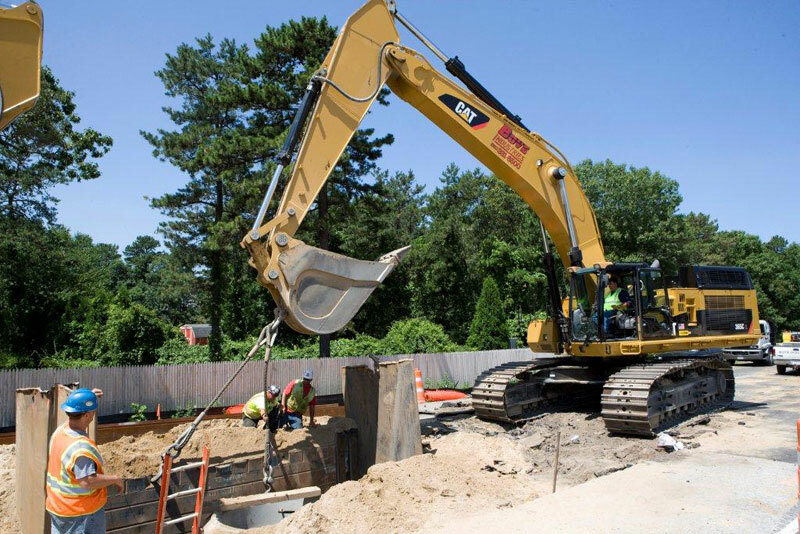 112 required an extensive upgrade to the existing underground water distribution and storm-water systems. The majority of underground work consisted of installing approximately 30,000 feet of reinforced concrete pipe, ranging from 15” to 48” in diameter, and to a depth of 30 feet below-grade. 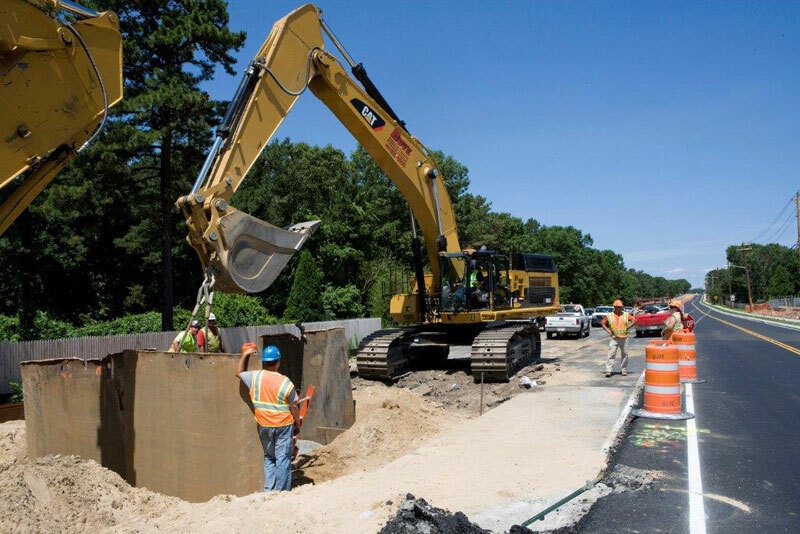 In addition to the utility work, the project included 125,000 cubic yards of roadway excavation and the construction of three new recharge basins to handle all the discharge water from the reconstructed roadway. 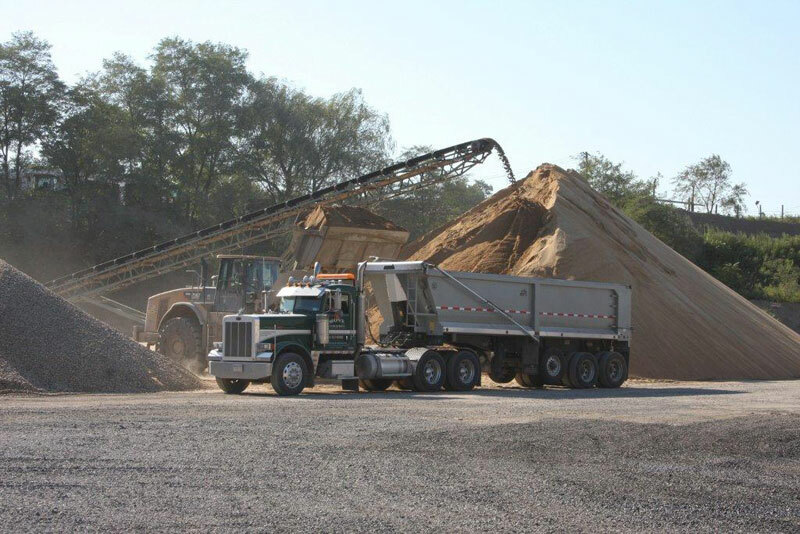 Other road improvement work included placement of 75,000 tons of asphalt pavement, as well as traffic calming and pedestrian safety improvements. Despite all the difficulties in relocating the overhead and underground utilities the project was completed 3 months ahead of schedule. 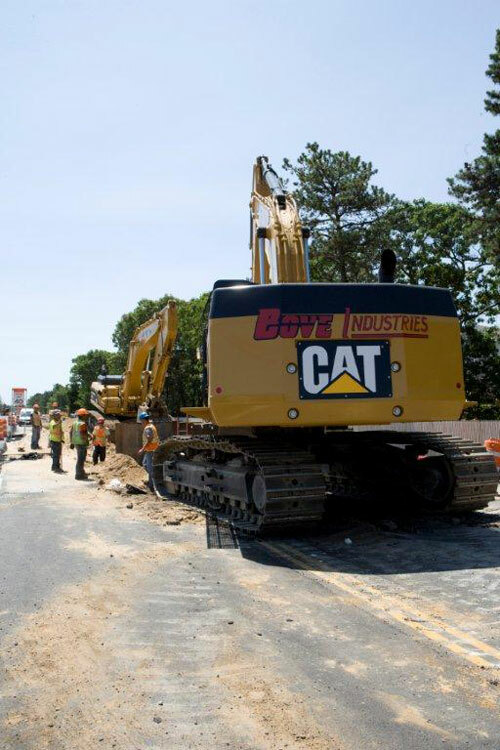 This contract was for the realignment of the intersection of Woodbury Road and Syosset-Woodbury Road located in Nassau County. Due to the drastic grade changes in the current intersection, a permanent sheeting system had to be incorporated in the new road re-alignment. Since this system would be exposed and located in a wooded residential community, this unique design had to be structurally sound and ascetically pleasing to the public. This was accomplished by drilling vertical shafts to depths ranging from 35’ to 40’ below grade and installing “H” piles encased in concrete with strict vertical tolerances so they could be incorporated in the permanent precast retaining wall system. 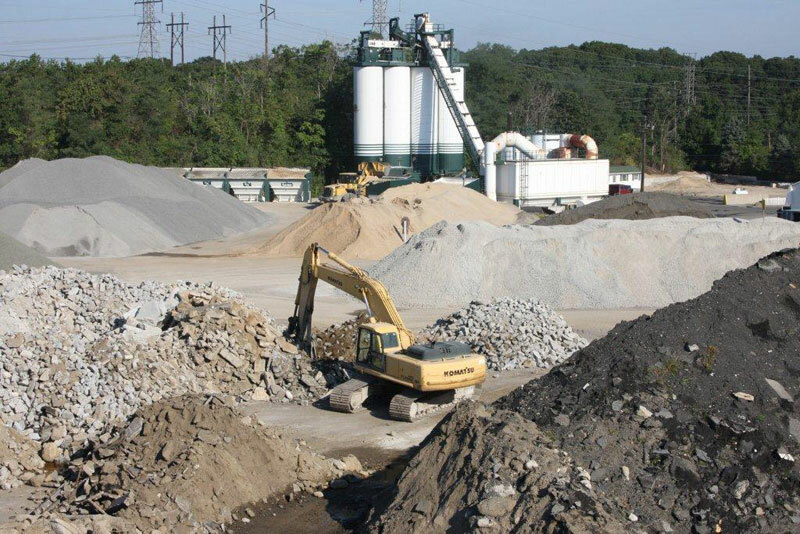 As the roadway excavation proceeded, wood lagging was placed behind the soldier piles and once sub-grade was established, the soldier piles were utilized as permanent columns for the precast panels to be slid between to create a decorative stone retaining wall. 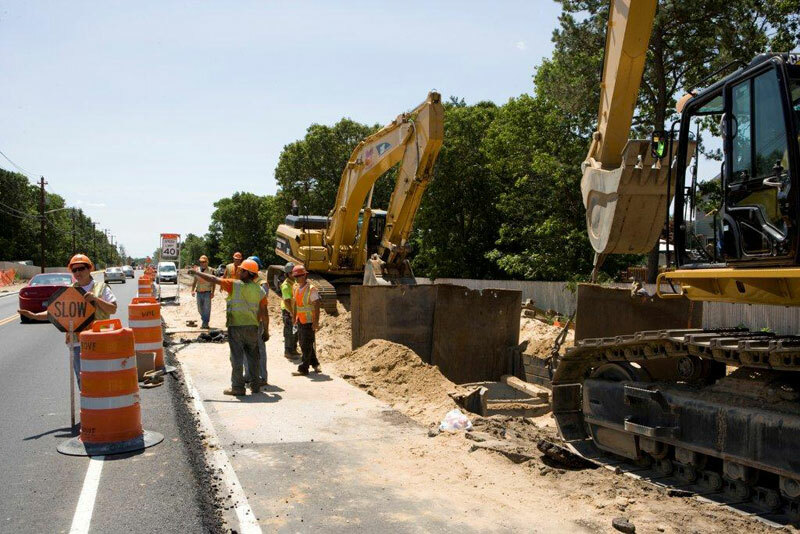 Other improvements included modifications to the existing storm and water systems, full depth road reconstruction, installation of new traffic signal equipment and asphalt overlay of entire roadway. 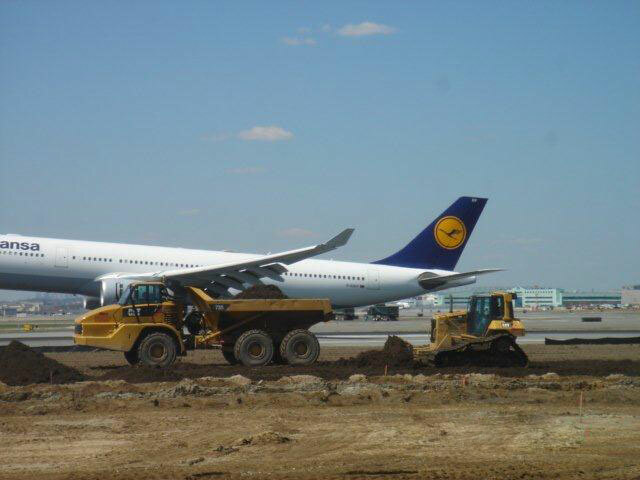 The scope of work for this project included: clearing & grubbing an 46 acre site, remediation of contaminated fill, excavation and regrading of approximated 40,000 CY of fill, dewatering, construction of infiltration drainage trenches, and establishing a vegetated cover to reduce flooding of Runway 4R-22L. The major item on this contract consisted of the construction of a new steel pile supported concrete encased storm sewer system, some of which was constructed along the edge of the east river requiring permanent steel sheeting and the remainder of the utility line was built over an active subway tunnel. Other utility improvements were the relocation of electrical and telephone duct-banks and the extension of several existing water mains lines. Upon completion of all underground work new concrete base and asphalt pavement, steel faced curbs and sidewalks were installed on North 5th Street, 6th Street, 7th Street, and a portion of Kent Avenue. The highlight of this project was the ability to value engineer the means and methods of installing the new 1,775 LF, 16” diameter forcemain from a conventional cut and cover operation to a directional drilling method. This method became cost effective and time efficient when you factor in the need to install an elaborate dewatering system and the delay in obtaining permits pipe and the possibility of additional asphalt restoration outside the pay limits due to expansion of trenches due to groundwater. All work associated with this project was completed ahead of schedule and with minimal inconvenience to the local community. The highlight of this project was the installation of approximately 40,000 trench feet of a dual 6” diameter force-main requiring the use of directionally drilling. This work was accomplished by installing approximately fifty jacking/receiving pits and performing drill bores ranging from 400’ to 900’ in length. In addition to the directional drilling work, a new 10” diameter interceptor sewer was installed, approximately 26’ deep, utilizing temporary steel sheeting to merge the two existing sanitary systems located in the towns of Locust Valley and Lattingtown to the County of Nassau Sewer System. Upon completion of the underground work, the concrete roadway was restored. This contract was a “make ready” package for the new underground parking garage and hospital expansion project. Prior to any foundation work, a majority of the existing underground infrastructure throughout the site had to be modified, relocated and/or replaced in preparation of the new structures. 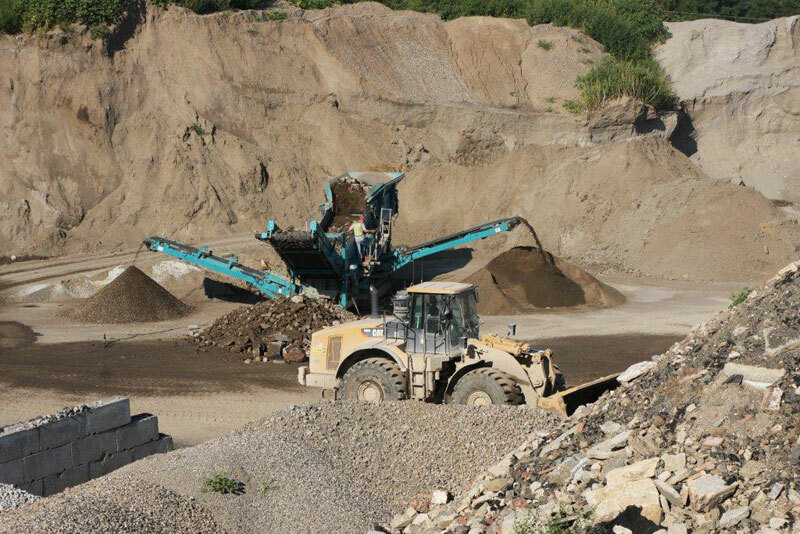 This required installing new concrete encased primary electric and tel-communication ductbanks, relocating existing water and sewer lines and the installation of 30’deep leaching basins in and around the site. 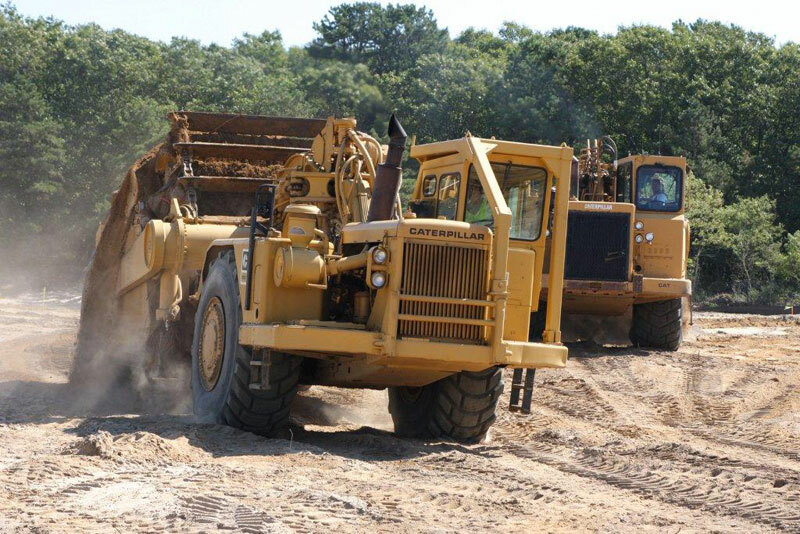 In addition to the “make ready” work, the contract required an extensive amount of site work. One of these components was the installation of a 24’ high precast noise wall within a restricted and highly combustible area of the hospital. Construction of this wall required working around an active Oxygen Storage Facility and an active temporary emergency room entrance. Due to these conditions, constructing this wall presented difficult logistic problems for our construction team. Prior to any work commencing, extensive planning and coordination with the hospital when it came to crane locations, erection sequencing and delivery of materials to erect the precast walls was paramount. The remaining site improvements included concrete retaining walls, new curbs, brick walkways, asphalt pavement, decorative seat walls, benches, granite pavers, fountains and the construction of a new plaza on top of the roof of the new parking structure. All the work was completed on time and without any major disruptions to the hospital. 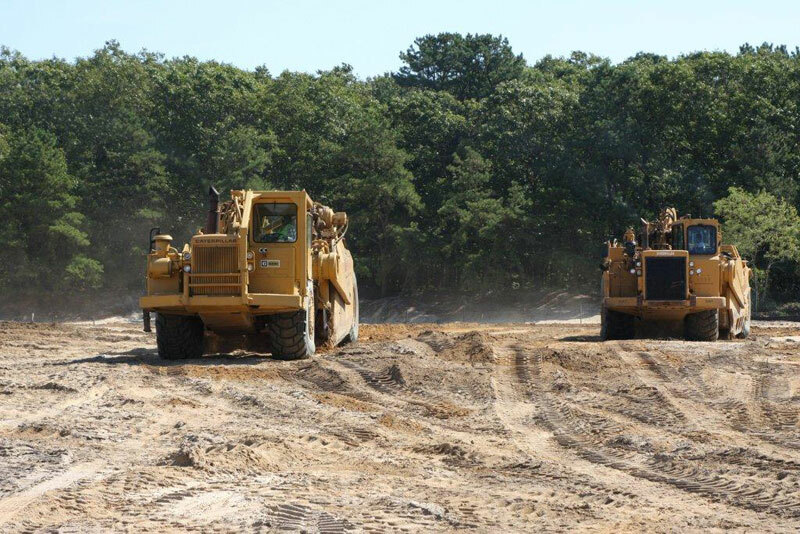 This project was a complete sitework, utility and building excavation package for a new 258,000 SF high school on a 70 Acre site. 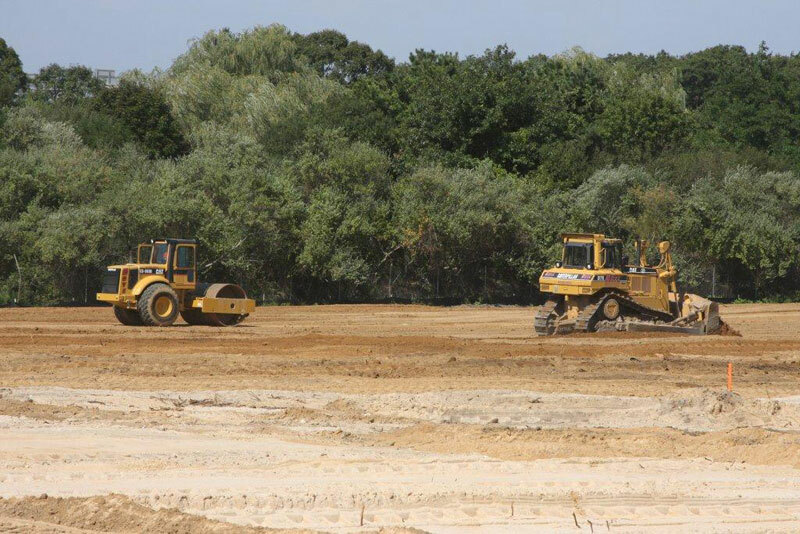 One of the major items was the excavation and placement on-site of approximately 100,000 cubic yards to create over 2,000,000 SF of new Athletic Fields. Utility work included the installation of 360 drainage structures ranging from 6’-22’ in depth, installation of 20,000 LF of storm drainage and the extension of a 12”watermain throughout the site. Other site improvements were the construction of new concrete curbs, sidewalks and the placement of 21,000 tons of asphalt pavement. Site amenities such as dugouts, bleachers, goal posts and perimeter fencing completed the scope of this contract.